In Boston, A Rare Rejection Of The Dead Usually, even the most heinous killers are buried without incident. That's not true for Tamerlan Tsarnaev, one of the suspects in the Boston Marathon bombings, whose body has become the subject of angry protests. Protesters gathered Monday outside the Graham Putnam & Mahoney Funeral Parlors in Worcester, Mass., where the body of Boston Marathon bombing suspect Tamerlan Tsarnaev is being prepared for burial. Tamerlan Tsarnaev is stuck in a no-man's land. 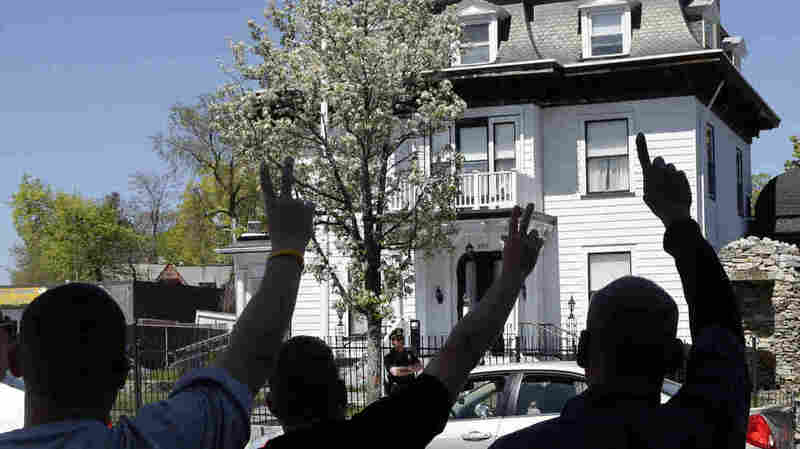 The body of the suspected Boston Marathon bomber has been at a funeral home in Worcester, Mass., since Friday, refused burial by local cemeteries. The funeral home was the site of protests through the weekend and on Monday, with some residents talking about taking up a collection in hopes of sending Tsarnaev's body to Russia. More than 100 offers for burial from out-of-state cemeteries have come in, but as yet none have panned out. Massachusetts politicians lined up to express support for the idea that Tsarnaev did not deserve burial in the commonwealth. "I think that the people of Massachusetts have a right to say that they do not want that terrorist to be buried on the soil of Massachusetts," said Rep. Ed Markey, the Democratic nominee in a special Senate election. Markey suggested that the federal government take control of the body, as did Robert W. Healy, the city manager of Cambridge, who refused to issue a burial permit. "We seem to have become distracted, protesting his burial when that's just what a civilized society does," says Bob Biggins, a funeral director in Rockland, Mass. "Now, our focus should be on healing and those who have been maimed and killed." The notion that some individuals may have been so villainous as not to deserve burial is an ancient one. In the book of Mark, Jesus speaks of Gehenna, the valley outside the walls of Jerusalem, where bodies of those who disobeyed God were unceremoniously dumped. The Greek tragedy Antigone, a play by Sophocles from the 5th century B.C., turns on the title character's efforts to bury her brother, whose body has been left out to rot. "There's some sense that those who are traitors to the human community must not be buried in it," says Reginald Gibbons, who has translated the play. "That's a very old feeling." But the play ends, Gibbons points out, with the gods being angry that burial was denied. In contemporary times, many of society's most notorious killers, including the shooters at Sandy Hook and Virginia Tech, have been granted burial, albeit at services kept private and secret. "The people one would immediately imagine having the most difficult time getting buried are people who assassinated presidents," says David C. Sloane, author of The Last Great Necessity: Cemeteries in American History. "But Lee Harvey Oswald was buried in a private cemetery." It's rare, but situations like this have happened before. In 2005, the body of Bart Ross, who had killed the husband and mother of a federal judge, went unclaimed and was headed for a pauper's burial, but a Milwaukee mortician named John J. Walloch donated a coffin and arranged for Ross' burial at his parish cemetery. "I said to myself, 'What's going on here? The guy hasn't got a single friend or neighbor or anybody?' " Walloch told the Chicago Tribune at the time. "That's when I decided to do something." Sloane, who teaches history and public policy at the University of Southern California, says locally notorious murderers will sometimes be buried beneath unmarked graves. "That's so people won't come and desecrate the grave, and not to create a place of notoriety," he says. "I can imagine that there is a sense that you don't want to create a space for like-minded people to gather." Such things have happened. The burial place of the Haymarket rioters, judged by history to have been unfairly condemned to death in the bombing death of several Chicago police officers in 1886, has become a shrine to activists and a National Historic Landmark. The body of terrorist leader Osama bin Laden was buried at sea, in part to avoid his burial place providing any sort of a shrine to jihadists. Protesters in Worcester have suggested that Tsarnaev's body be similarly cast into the sea, offering fodder for sharks. "To me, it's simple: he should be buried at sea with Bin Laden," tweeted Gabriel Gomez, the Republican Senate candidate in Massachusetts. Biggins, a former president of the National Funeral Directors Association, says people in his profession take care of bodies regardless of the cause or circumstances of death. Regulations vary by state, but in Massachusetts, cemeteries have the authority to refuse burial. "Cemeteries are allowed to refuse burial for reasons they feel are to protect the greater good," says Cameron Smock, president of a Seattle funeral home. In 1997, Congress passed a law banning veterans guilty of capital crimes from being buried in military cemeteries. It was meant to deny such honors to Oklahoma City bomber Timothy McVeigh, whose ashes were privately scattered by his attorney. Still, there aren't many cases like Tsarnaev's. "Quite frankly, I'm surprised there is not a cemetery that is willing to step forward and offer burial services in this situation," Smock says. "Honestly, I don't recall in my 28 years in the profession a situation where the perpetrator's body was not allowed burial rites." And, Biggins says, no matter how terrible Tsarnaev's alleged crime, "He can't hurt anybody anymore." "The grave's a fine and private place," wrote the English poet Andrew Marvell in the 17th century. But no more. Funerals have become staging grounds not just for grief but also for protests. A number of states have enacted laws banning protests at funerals, in response to anti-gay rallies held by Westboro Baptist Church. "The family can have peace and say goodbye to their loved ones without hearing screaming and noise," says North Carolina Republican state Rep. John Szoka, who sponsored a bill this year to strengthen that state's ban. Most Americans find the Westboro protests outrageous because they believe deeply in the right of a family to bury their dead and not be challenged about it, Sloane says. That's what makes the protests in Worcester unusual. Tradition dictates that bodies of even the most heinous criminals be given over to the families to deal with in their private grief. "Even in situations like this, the family deserves that right, whether the community agrees with it or not," says Smock, the Seattle funeral director. It's not clear why the body of Tsarnaev has sparked such strong reaction, when other killers have been buried without incident. It's possible the combination of a horrific terrorist attack and the fact that Tsarnaev was an immigrant and a Muslim have fostered a sense that he was not part of the local community, Sloane says, and cemeteries are very much seen as belonging to communities. Regardless of his actions, though, a funeral home is not the appropriate place for such public expression of anger, says Szoka, the North Carolina legislator. "I'm not really in favor of protesting outside funeral homes, no matter how disgusting the individual or whatever he did," Szoka says. "There are other venues for that."